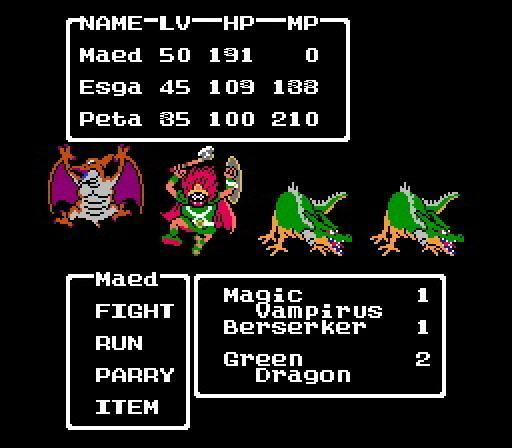 While the original Dragon Quest--repurposed as "Dragon Warrior"--found some mild success in the US thanks to a dynamic Nintendo Power promotion, its NES sequels didn't really catch on here. Which is disappointing, because I think the series as a whole can hold its own against any other RPG franchise. 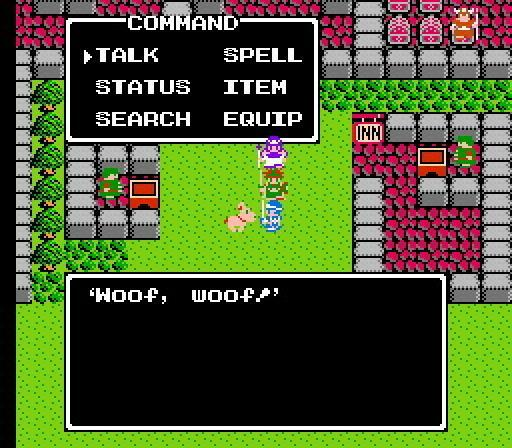 That said, Dragon Warrior II is perhaps not the best example of the series' strengths. Three cousins on a quest! There's definitely a classic appeal about this franchise. Like the original game, DWII puts you in the boots of a courageous hero (a prince this time around), ready to take up his sword, fulfill his destiny and save the day. But this time he won't be squashing Slimes alone; the major innovation of DWII is the addition of two other playable characters who fight alongside you in the games' numerous battles. Your first companion, the Prince of Cannock, is a prototype of the Pilgrim/Priest/Cleric class that would surface in later games, providing support but not being able to handle heavier, sturdier equipment. The Princess of Moonbrooke rounds out the crew, wielding an arsenal of spells and a low defense rating, which makes her the series' first Mage. The Prince of Midenhall (the Hero) is far and away the strongest cast member--which makes the game sometimes feel like a babysitting mission--but the extra party members certainly help give the game more combat variety and strategy than the original. The other major innovation comes along with the extra party members: you will now often fight groups of foes instead of just one. And with that mention comes the game's first major problem: balance! Once you reach around the halfway point of the game, far too many difficult enemies drop Gold and EXP at disproportionate levels based on their difficulty. 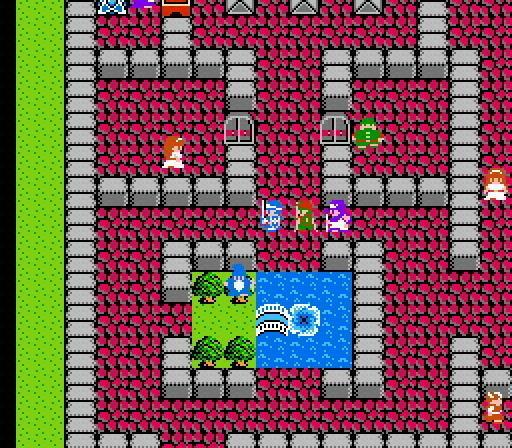 This ends up making one of the most appealing parts of Dragon Quest--attempting to take down big, scary enemies for big, sweet rewards--notably muted when an enemy twice as difficult as the minions you've been slaying drops a pittance more Gold for your trouble. The endgame in particular forced me to grind for 3-4 hours in the same spot just to stand a chance against the brutal final boss gauntlet. Even the lucrative Metal Babbles (who made their series' appearance here) don't seem to drop an amount of EXP that makes them worth the trouble. If this screen doesn't strike fear into your heart, you must not have played this game yet. I like challenging games, and one of my favorite things about the DQ series is that it's tough! You have to manage your resources well, play smartly, and know when to charge ahead and when to turn back. But there's way too much left to luck in this game; some of your basic combat spells will miss up to half the time (Explodet, anyone?) while enemies have a 100% success rate with them. There seems to be no rhyme or reason for who goes first or why. The party members when targeting a group will often distribute the damage in an unintelligent, inefficient way ("Why are you hitting the almost-dead thing for 100HP when you can kill the other guy with full life in one hit? "), the Gold Batboons can wipe out your party, Sleep attacks can be absolutely brutal and leave you wide open, etc etc. And as noted, Cannock and Moonbrooke are far outclassed by the Hero (who doesn't have the greatest stats himself compared to the enemies), so a lot of the challenge is in simply keeping them alive. I did like how this made "Parry" (or Defend) a rather viable option throughout the game. That's kind of refreshing. The visuals and sound are about what you'd expect for an NES game made in 1990. The field graphics are somewhat basic but the character and monster design is undeniably charming, with a lot of series regulars making their debut in this game. The music fares nicely too, with more songs than the original game. That said, I think the DQ soundtracks got quite a bit better after this game, which still has some odd compositions (such as the schizophrenic battle music). The menu actions are somewhat convoluted, but more streamlined than DQ1's. I really enjoyed the first half of the game, which felt challenging but fair, and had several memorable moments and setpieces (such as the game's tragic prologue, and how you acquire Moonbrooke). And as a Zelda 1 fan, I appreciated the nonlinearity of the second half when you get a ship (another series first!). But mixing exploration with a too-large world, no map, random battles, multi-layered world-spanning puzzles, limited teleportation, and enemies that can quickly kill your party makes for a rather overwhelming, confusing experience. And boy, is it long. There's a lot here, especially if you don't know where to go. But by the end, I was losing my patience and simply started finding online maps to get through the last few areas as quickly as possible. This sounds like a lot of complaining, but I have to give the game major props for setting the JRPG standard of multiple party members and multiple enemy groups. That's a major breakthrough that's still done today in just about every JRPG. There's a lot of game here too, lots of enemies, dungeons, items, and even a couple side things and secret drops, etc. There are some big surprises that are surprisingly memorable (including a great throwback around the halfway point). The visuals are decent, as is the soundtrack, particularly the File Select and Credits. So it's still a worthy game, just my least-favorite in a very consistently good series. Try it out if you're up for the challenge, but don't be afraid to check out some online maps and tips! After all, they were standard issue with games like this back in the day. Hmm! Interesting review. I've only had experience with the GBC version of the game, but it seems the NES version has its own charms. If it ever hits the VC (when will that be, Squeenix?!?) I'll download it. Thanks for the review, Matthew! No problem! I actually am doing kind of a personal project right now--I'd like to have reviews of all the mainline Dragon Quest games on this site eventually (I've got 2, 5 DS, and 6 DS now). I'll be doing 1 (NES) soon, then 3 (GBC version) once I finish it for Backlaugust. Regarding NES vs. GBC, I haven't played the port, but I hear it balances out the game a bit more, which makes it more playable. The tradeoff is the zoomed-in view, which kind of feels a bit more claustrophobic than the NES games. DW3 on the GBC has a similar deal, although I'm really enjoying that one regardless. I'd happily buy any DQ port for the eShop--NES, GBC or otherwise--but there's something weird about this series and the VC. There are zero Dragon Quest games at all on any Virtual Console. Similarly, Dragon Warrior is suspiciously missing from the Mini-NES lineup. No idea why, but it's annoying! Those problems couldn't be redeemed for me, so I don't like this game either. After playing these first two games, I had figured that I just didn't like Dragon Warrior as a series, and so it was a long time before I tried another game in the series. What brought me back was that I have a friend who is really into the series, so I probably wouldn't have gone back otherwise. I'm glad I did though, because the later games are much better. I'm still curious to try the GBC game at some point though. I wonder how much it would help, it's kind of risky which is why I haven't yet. I think Dragon Warrior IV is one of the best games on the NES, and Dragon Warrior III blows II out of the water..which blows Dragon Warrior (1) out of the water. And thats the way its supposed to go; progression! ..And I read your review of II, have you read mine? Of course! I posted in there, mate!